Mauro posted a definition of 'location awareness' on his blog last week. He defines it as "A continuous availability of the spatial positions of the agents involved in the interaction for the agents themselves.". Since I am dealing a lot with this fuzzy notion on awareness, I would like to comment a bit on that. Technically speaking, theories about 'awareness' are not so cognitive psychology oriented, it's more related to HCI or CSCW concerns (even though some cognitive sciences researchers now work on that notion). Dourish and Belloti (1992) have given one of the best-known definitions for awareness: “awareness is an understanding of the activities of others, which provides a context for your own activity”. 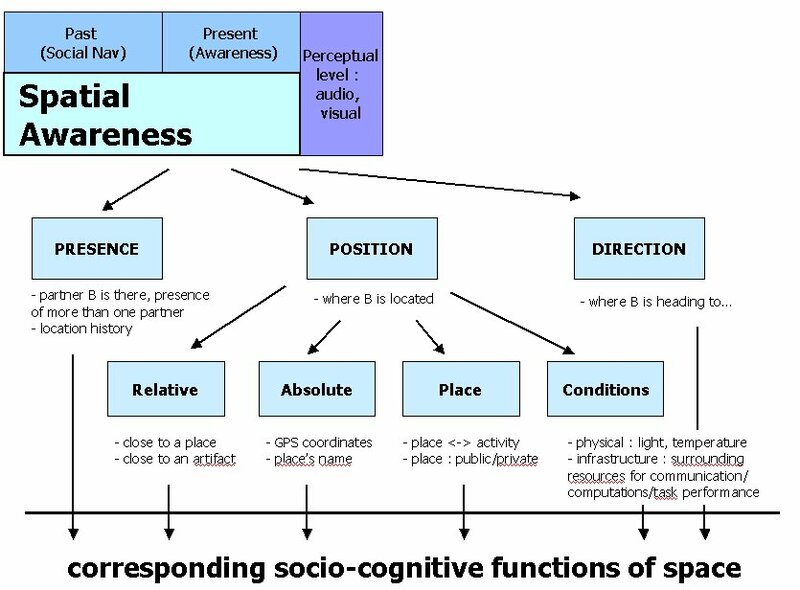 Drawing on this, location awareness would be "the understanding of the others' position" which of course as Giles supposed (in a comment of Mauro's post) imply some cognitive processes to be activated. Is knowledge about a state of the work environment in a limited portion of time and space. Provides knowledge about changes in that environment. Is maintained by all the interactions between the team-mates and the environment. Is a part of an activity (completing a task, working on something…). Maintaining awareness is not the purpose of an activity. Awareness is used to complete a task. The definition goes further here since they state that awareness is about having a constant flow of information (perceived and updated). Another interesting point is that awareness of others is not maintained for the sake of it but is a part of an activity (at least it's a presence indicator).